Amid all the pro circuits and premiers for games like Street Fighter and Tekken, you might have forgotten about another classic: Virtua Fighter. Last night in Japan, 510 entrants gathered in Tokyo to play some Virtua Fighter 5: Final Showdown and y’all, it was pretty rad. 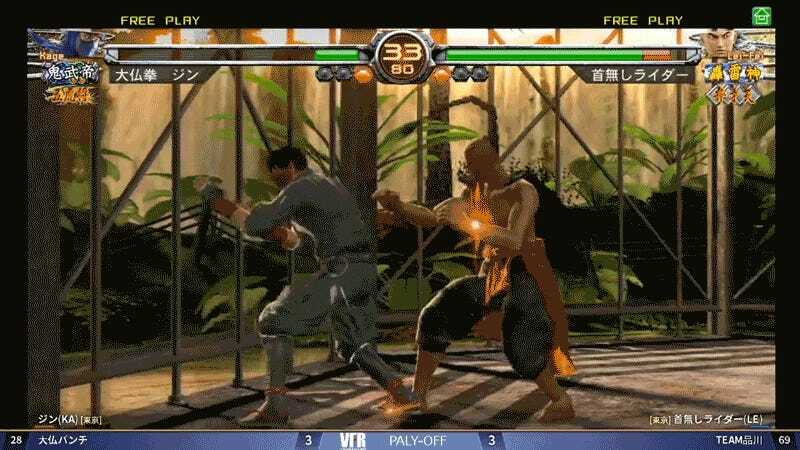 To boil it down, Virtua Fighter is a very technical game. Though the inputs are simple, what you can do with them is expansive. It was the arcade machine too daunting for me at a young age, commandeered by the VF elite, so I would watch from afar while waiting for the Tekken Tag Tournament cab. The Beat Tribe Cup, according to info from the Virtua Fighter message boards, has been on a bit of a lull. “After a four-year hiatus, it’s almost here!” reads one advertisement. Last night, the 16th edition of the team tournament got underway, pitting 102 teams of five against each other to see who would be the ultimate Virtua Fighter, and it was settled right where the Virtua Fighter passion lives on today: in a Tokyo arcade. Watching last night, it was incredible to see high-level Virtua Fighter being played in 2018. The moves were crisp, the punches and kicks meaty, and the throws were moments of absurd hype. The crowd and announcers got hype watching a lucha libre wrestler, in full blue bodypaint and a lion’s head, continuously throw his opponent to defeat. As a 3D fighter, there are also walls that can be used as an out if you get locked into the corner. But one fighter found out, what he can use, the opponent can too. The broadcast was solely in Japanese, so unless you speak the language it’ll be hard to follow the specifics. You can still get the gist of it, as the crowd noise rises and falls with the action, and chants of “hai! hai!” line up with combos. The matches are fantastic, and well worth a watch just to see the passion these folks still have for Virtua Fighter. 510 entrants showing up for a game that doesn’t have a pro tour behind it? Sign me up. If nothing else, maybe it’ll plant the idea in someone’s head that we’re damn well due for a new Virtua Fighter. In the meantime, if you’re craving some Virtua Fighter action, a fully playable version of Virtua Fighter 5: Final Showdown is in Yakuza 6.